Prince of Peace Mango Ginger Chews are 100% all natural. They are an easy, convenient and tasty way to enjoy ginger. 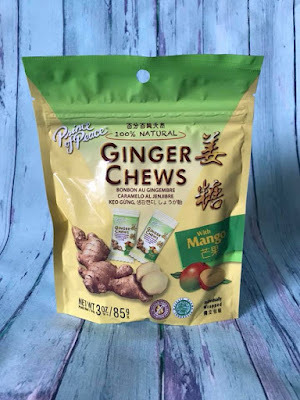 They have a delight balance of sweet and spicy ginger taste with a pleasant chewy texture. 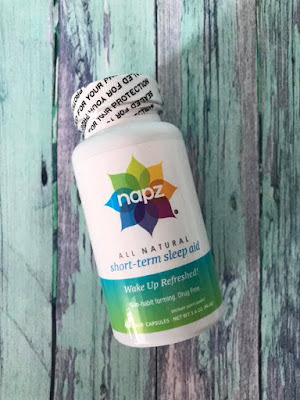 Napz All Natural Short-term Sleep Aid allows you to wake up refreshed! These veggie capsules are non-habit forming and drug free. Just take 2 capsules 20-30 minutes before bed. BiPro Protein Water contains 20 grams of protein. 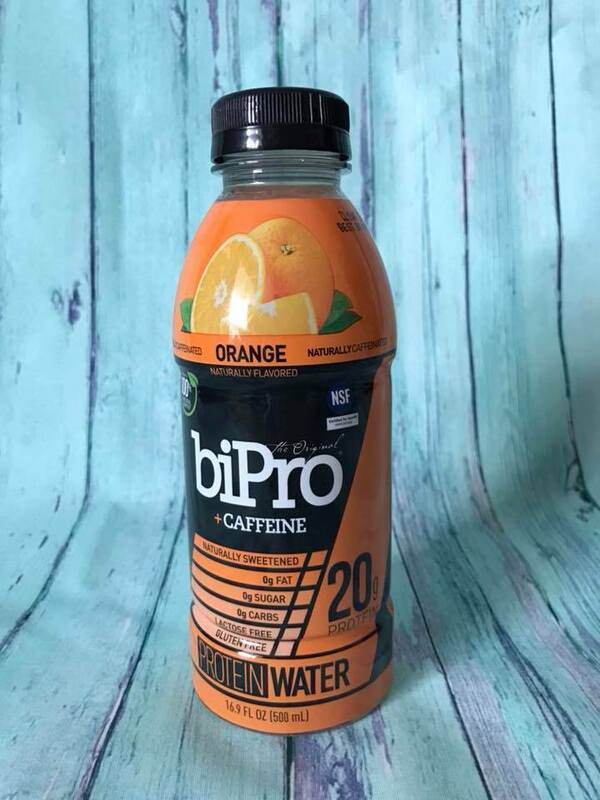 This protein water contains caffeine, is naturally sweetened and doesn't contain any fat, sugar or carbs. It is also lactose free and gluten free. Andalou Beauty is Renewal Face Cream contains fruit stem cell complex, vitamin C and probiotic microflora. These ingredients uplift tone for a lighter, tighter and brighter looking appearance and a luminous complexion. 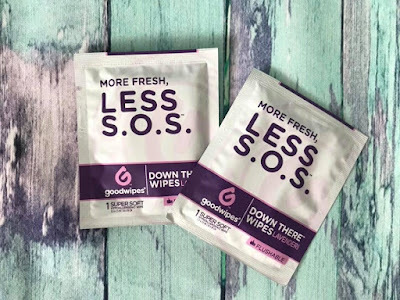 Goodwipes Down There Wipes are flushable and 100% biodegradable. 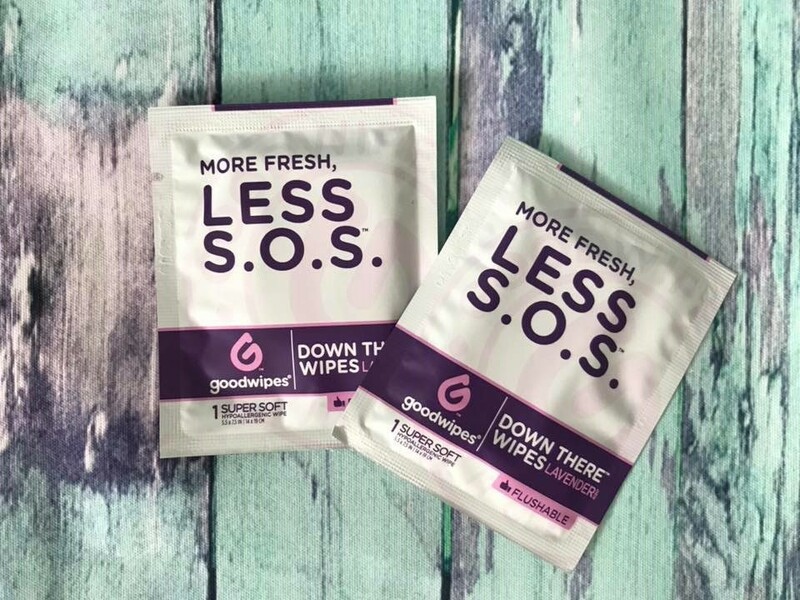 They contain soothing aloe and vitamin E. These wipes are convenient and perfect for on-the-go! Herbal Zap Digestive Support is an instantly dissolving herbal supplement. 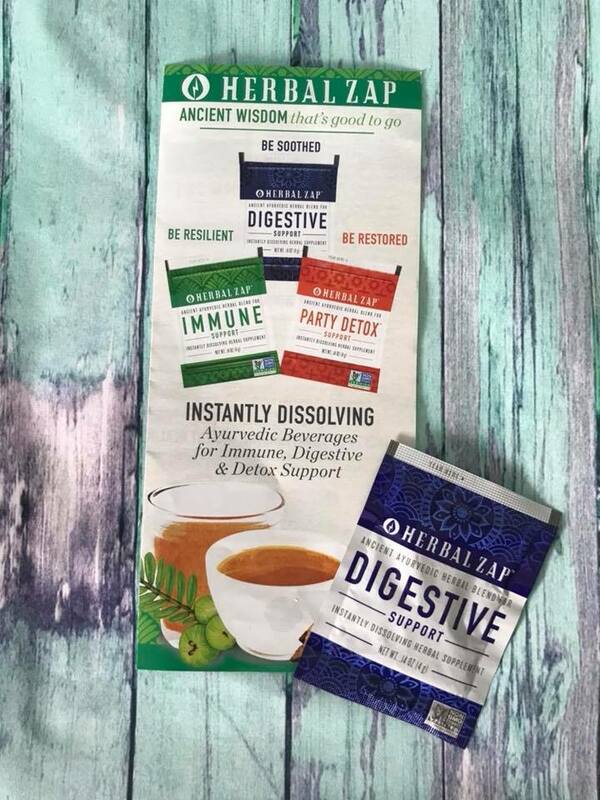 It is designed to soother and support the digestive system, easing irritation from acidic, overly spicy foods or sensitivities. Choice Organic Teas are Fair Trade Certified and non-GMO. 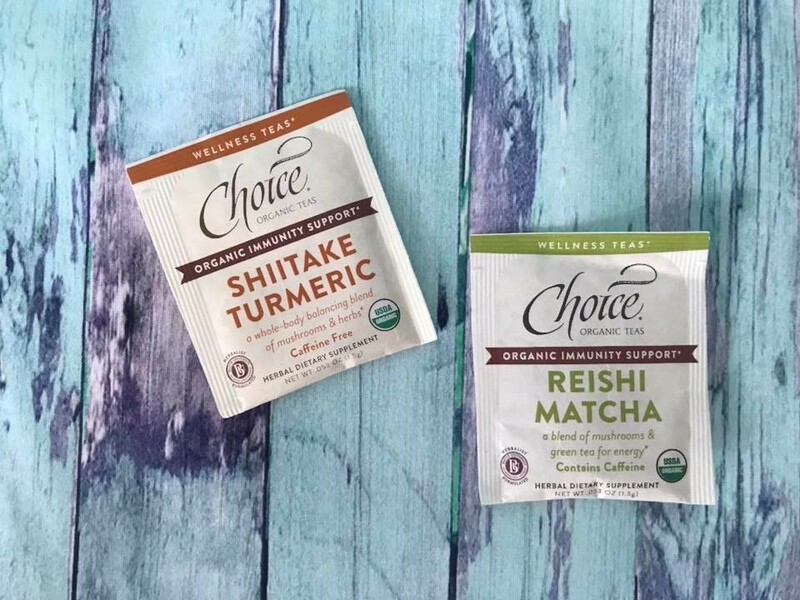 Choice Organic Teas were the first exclusively organic tea crafted in the USA. The flavors I got to try were Shitake Turmeric and Reishi Matcha. 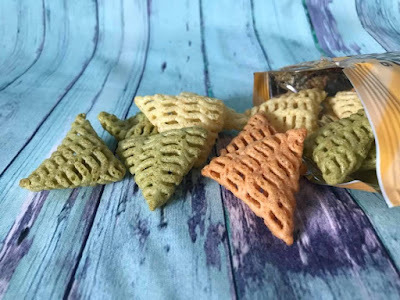 Good Natured Selects Veg-ables are light and snack-able and include several nutrients extracted from wholesome vegetables like spinach, carrots, and tomatoes. With the great taste and crispy bite, this is the wholesome snack your whole family will enjoy! I love trying before I buy. I have never tried any of these products in this box before. That's what is so great about Daily Goodie Box. This is the third time that I have qualified for a box and each time, the box is loaded with awesome products. They always have a great variety. My favorites: Goodwipes, Choice Organic Teas(Reishi Matcha), the ginger chews and the renewal face cream. Sign up to receive a Daily Goodie Box! Remember, in order to qualify for a Daily Goodie Box, follow them on Facebook and like, share and comment on their posts! Welcome to A Sampling Bee! 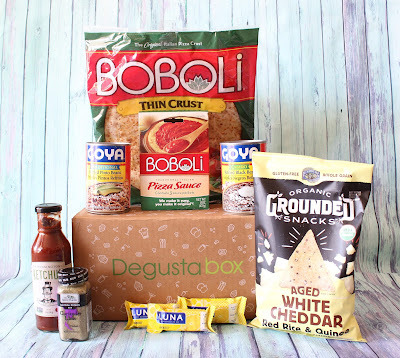 I am back with another awesome food subscription box from Degusta Box USA! 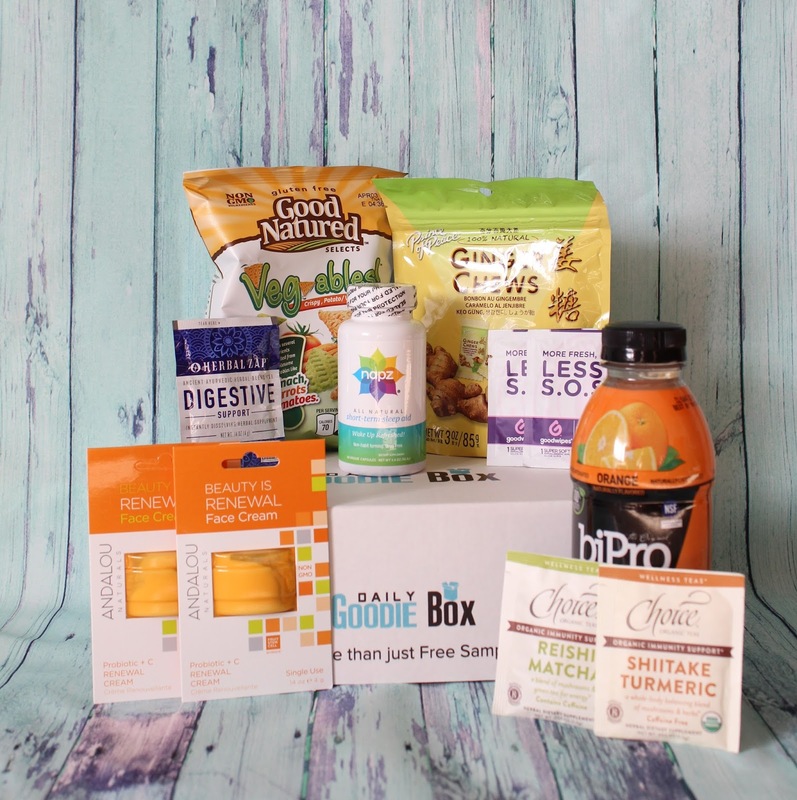 Receive 9-14 full-sized products delivered to your door monthly for only $19.99! 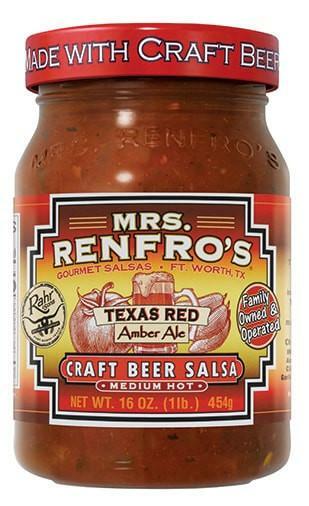 You'll get food items such as pastas, salsa, chips, desserts, sauces, condiments and even drinks! This is a food subscription box that you'll love. Also, it makes a great gift! See what's inside February's box below. 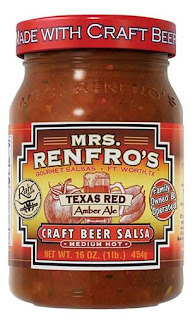 *2 products in this month's box were ruined during shipping(Salsa & Mustard). I received Degusta Box USA in exchange for my honest review. All opinions are my own. Always! Post contains affiliate links. Sign up for a Degusta Box USA subscription today and save $10 off of your first box! Pay only $9.99!! Welcome to A Sampling Bee! 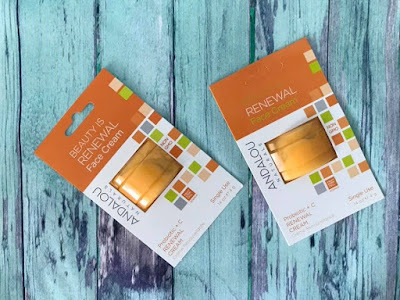 Today, I share with you skincare products from AMG Naturally! The founder and CEO of AMG Naturally has been a practicing nutritionist for over 15 years. Linda Lizotte has successfully treated thousands of clients with a wide range of health issues. Linda has developed a line of skincare products that are natural and safe to put on your skin. Linda is the founder of the #1 nutraceutical company in the country. Morning Glory Moisturizer- The synergism of healthy oils: Aloe, Moringa, Jojoba, Avocado, Sea Buckthorn and more, will deeply moisturize, rehydrate and nourish dry, thirsty skin. The proprietary, transdermal delivery system allows for deep absorption into the skin making this a moisturizer to use every day to soften the skin. Continued use allows for promotion of skin firmness and elasticity and protection from environmental damage. SPF chemicals, meant to stay on the surface of the skin, are too harsh for your skin and may make you more susceptible to skin cancer. Protect your skin naturally with antioxidants and sun-blockers found in nature; rather than blocking vitamin D production in the skin. Nature knows best. Ingredients: Aqua (purified water), Moringa oleifera seed oil, Helianthus annuus (sunflower) seed oil, caprylic/capric triglyceride, stearic acid, glyceryl stearate, dimethyl sulfone (plant MSM), Butyrospermum parkii (shea) butter, Plukenetia volubilis seed oil (Sacha inchi), glycerin, glyceryl stearate SE, Persea gratissima (avocado) oil, Simmondsia chinensis (jojoba) seed oil, Cananga odorata flower oil, xanthan gum, sodium hyaluronate (hyaluronic acid), tocopherol, magnesium ascorbyl phosphate (vitamin C), Aloe barbadensis leaf juice, gluconolactone, Rosa canina seed oil, Hippophae rhamnoides fruit extract, Moringa oleifera leaf extract, calcium gluconate, Rosmarinus officinalis (rosemary) leaf extract, Vitis vinifera (grape) seed extract, proprietary plant-based preservative system. 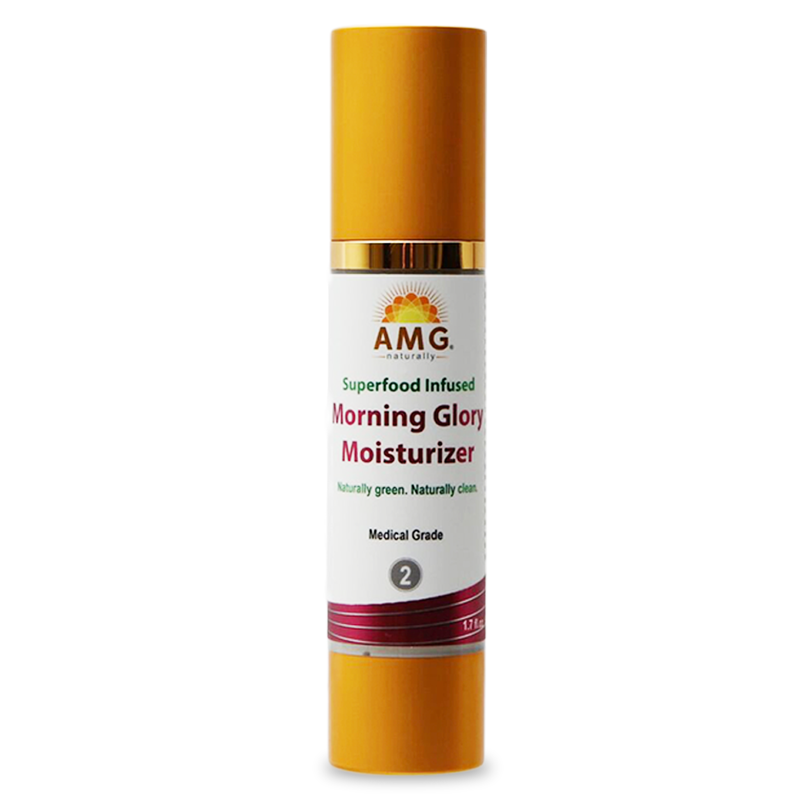 Directions for use: After using AMG's Papaya Splash Face Cleanser, spray with Mineral Mist, then apply Morning Glory Moisturizer gently and evenly over the entire face for softer, healthier skin. Miracle Elixir Oil- This botanical elixir for skin and hair contains a synergistic blend of Moringa oil with Sacha Inchi oil. By pairing Moringa oil’s potent antioxidants and anti-inflammatories and high oleic acid content (also found in Olive oil known for healthy Mediterranean skin) with the high omega 3 content of the Sacha inchi plant, this elixir provides a much-needed, healing tonic for stressed hair and skin. This oil combination is ideal for combating the signs of aging and dryness of face, hands, and extremities. With continued use, this elixir has the potential of ridding acne, rosacea, psoriasis, eczema and redness of the skin. Why did Linda Lizotte, R.D. add CoQ10 and vitamin E to our Elixir Oil? 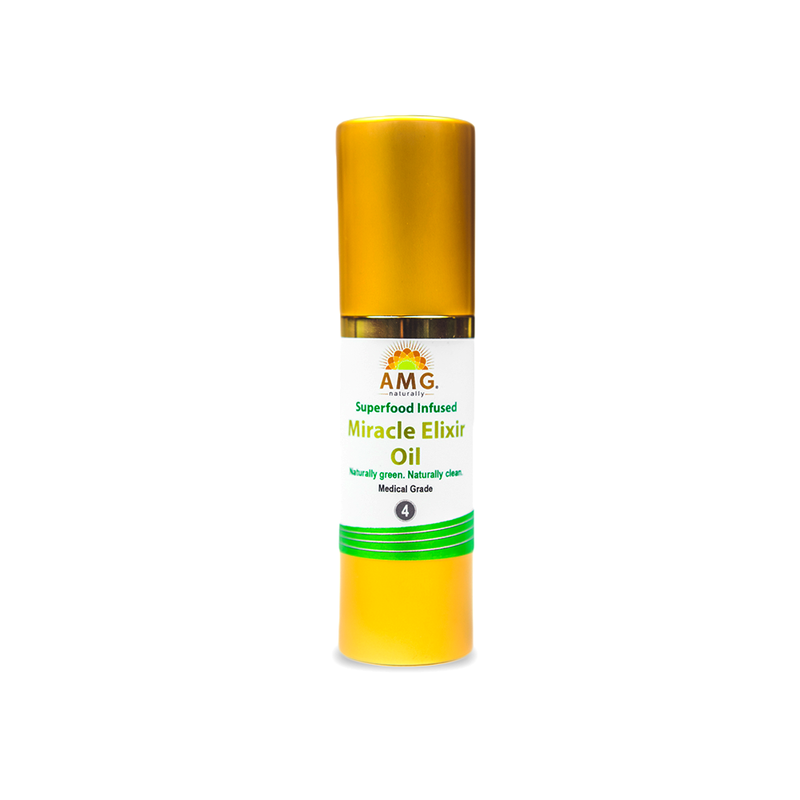 AMG's Miracle Elixir Oil now contains not only Miracle Moringa oil and anti-inflammatory Sacha inchi oil but also CoQ10 and vitamin E.
Research also reveals that vitamin E works on epidermal and fibroblast growth factors to protect the skin from oxidative stress (anti-aging) from factors such as photodamage (excessive sun exposure) and other environmental assaults. Ingredients: Moringa oleifera seed oil, Plukenetia volubilis seed oil (Sacha inchi), Cananga odorata flower oil, Ubiquinone (CoQ10), Rosa damascena flower oil, Tocopherol (Vitamin E), Rosmarinus officinalis (Rosemary) leaf extract, Eucalyptus globulus leaf oil, Helianthus annuus (Sunflower) Seed oil. Directions: Apply a small amount to your fingers and rub gently into the skin. Allow a few minutes for the oil to be absorbed. Dispense onto cotton pad to remove mascara and makeup. Rub into hair before bed and wash out in the morning. Use daily, prior to make-up, for a clear, matte finish with beautiful shine. Airless pumps: Always know how much product you have left and no wasting product you paid for that is left at the bottom. Dead Sea Mud Mask- AMG Naturally's Dead Sea Mud Mask also features Bentonite and French clays. It is designed to pull out toxins while increasing circulation to the face bringing vital nutrients and oxygen to your cells while carrying away toxins. The Dead Sea is 1320 ft. below sea level making it the lowest place on the planet. It is 10 times saltier than oceans. All streams and rivers in the area flow into it bringing rich minerals including calcium, magnesium, potassium, iron and sulfur. This mineral rich mask leaves the skin soft and healthy. 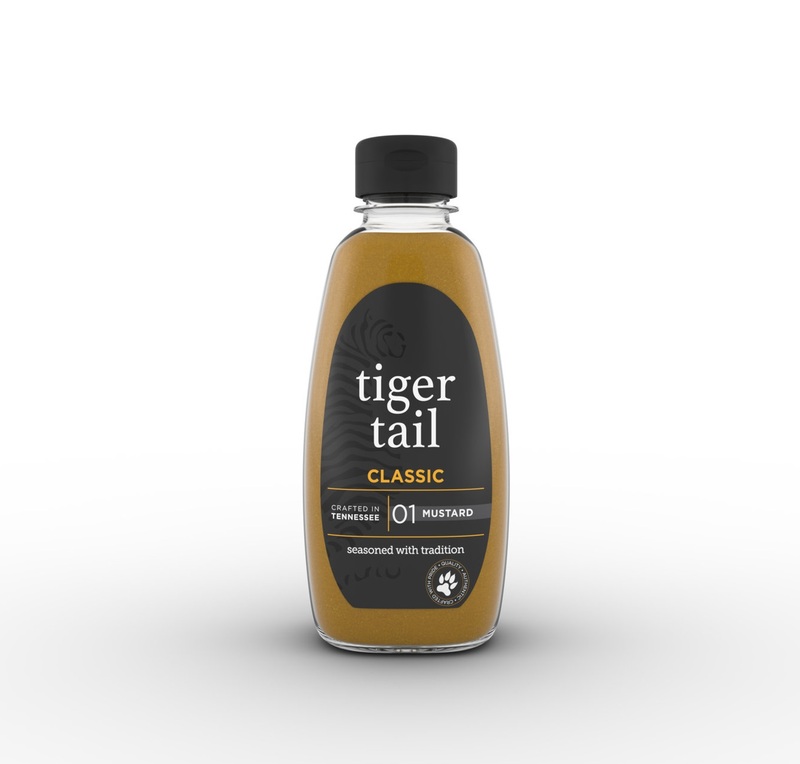 All-natural plant preservative and anti-bacterial system based on citrus extract and moringa oil. Ingredients: Aqua (Purified water), Dead Sea mud, Kaolin clay, Bentonite clay, Volcanic clay, Marine colloidal clay, Glycerin (plant glycerin), Dimethyl Sulfone (plant sulfur), Moringa oleifera seed oil, Sunflower oil, Sacha Inchi oil, Stearic acid (plant-derived emulsifier), Caprylic/Capric Triglyceride (Coconut-derived emollient), Glyceryl stearate (plant-derived emulsifier), Moringa oleifera leaf extract, Citrus medica limonum (lemon peel extract), Essential oil blend. Directions for use: Apply a thin layer to face and neck. Avoid the eye area. Let dry from 5 to 10 minutes. Rinse with warm water and washcloth. For best results use twice weekly. AMG Naturally has wonderful, natural skincare products. Now that I am getting older, I try my best to use better skincare products. Especially on my face. I really love all three of these products. The moisturizer keeps my face soft and nourished without having to deal with breakouts. I love using the elixir for removing my eye makeup. It works so well! I also use the elixir in my hair. My hair is down to my waist so sometimes it needs a little oil. Helps with brushing it. ;) The Mud Mask is great for when my face needs a little extra attention. I usually use it twice a week. 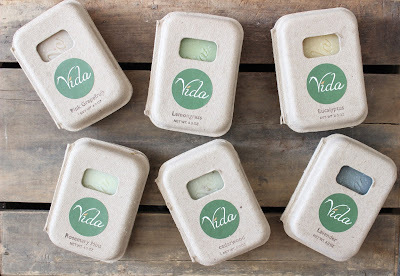 Each of these products has a little bit of a scent to them. Nothing floral, just the scent from the natural ingredients themselves. I really love AMG Naturally's products as well as what they stand for. Great skincare with all-natural ingredients! I received free AMG Naturally products in exchange for my review. All opinions are my own.